Cheadle Hulme School was in need of a Band Practice Studio/Drum Room, but “it must be sound-proof”. The room designed and supplied by Boxylab s.r.l. was the perfect answer – once built there was no sound transmission past 1m and none above low ambient into the wider space. Three acoustic modular pods were installed into the University of Central Lancashire Media Factory, all acoustically treated with absorber panels, acoustic floating floor, acoustic doors and studios windows. Dulwich College found an intelligent way to transform a waste area – a shed sandwiched between two music department blocks – into a new location for a Drum & Band Practice Room. The practice room is designed to reduce sound transmission well beyond BB93, avoiding interference with other music lessons. Acoustic Panels installed in Kent College’s dining room and sports hall have greatly reduced the RT and improved speech clarity. Olney School hall was transformed with acoustic panels from Amadeus; with a noticeably lower reverberation time, the acoustics can now be enjoyed by all users of the school hall. Instrument storage trolleys in vibrant colours to brighten your school classroom or complement your colour scheme, as seen at Comber Grove School in London. Find out more about Amadeus on Facebook, Twitter and Google+. Dragon School music department applied for planning permission to extend their existing music school, yet were struggling to get permission for the build. They found an unused space abutting the existing music department to erect a temporary building and plans were then put in place to install 13 brand new Boxy modular acoustic music studios, including floating floors, suspended ceilings and fully decorated and carpeted hall ways. Bespoke reflection panels designed and installed by the Amadeus team to enhance the acoutics within the brand new school Theatre. Our acoustic consultants carried out numerous tests to decide how best to treat the acoustics in the theatre, and provided a solution that suited the needs and budget of the project. We also designed and installed the wooden handrails in the theatre. Amadeus installed a new music department, The Tallis Music School, within a listed building at Dover College using BOXY modular soundproof rooms. Amadeus were asked to provide musicians chairs and audience seating for the new Royal Opera House, the premier venue for musical arts and culture in Oman. Amadeus helped refurbish Oxford University’s Faculty of Music in 2010 with nine acoustic modular studios designed to utilise the maximum amount of space within the existing Faculty building. Amadeus products featured on BBC 2 television show! Amadeus installed an acoustic pod into the converted garage/barn of a young drummer who wanted to practice late into the night without disturbing surrounding neighbours. This stunning soundproof “pod” fits perfectly within the existing building, working around structural obstacles such as supportive ceiling beams. We introduced Bedstone College to our BOXY© acoustic pods and they were blown away by the product; they now have 5 of their own – a recording studio, band practice room and 3 smaller music teaching rooms – all positioned in close proximity yet there is no conflicting sound. Having spotted a niche in the rehearsal space market in Glasgow in 2009, Lynne Howard contacted Amadeus about our BOXY© Modular Rooms. Our largest soundproof studio installation; a control room and a live room for small performances and recordings installed, in China, ready for Shanghai to become the “EXPO city” for 2010. Amadeus provided successful acoustic treatment for the rehearsal room of the Black Dyke Band – one of the worlds most celebrated and illustrious brass bands – including Absorbor panels, BAD panels and Opus chairs. Opus chairs in Holland, and a bit of Dutch press! Amadeus installed two modular soundproof rooms for music practice and recording on a mezzanine floor at Leeds College of Art; sound management and use of Natural Light were important factors due to the location of the rooms. Amadeus provided bespoke instrument storage for the prestigious Royal Russell School, including moveable instrument racks and purpose built lockers to fit into the space available within the school. Such storage prolongs the life of musical instruments and keeps the schools insurance premium down as instruments are less likely to be damaged, stolen or lost. Amadeus were tasked with the supply and installation of five acoustic rooms for Stonyhurst College, required to replace some “totally unsoundproof” music practice rooms built in the early 1900’s. 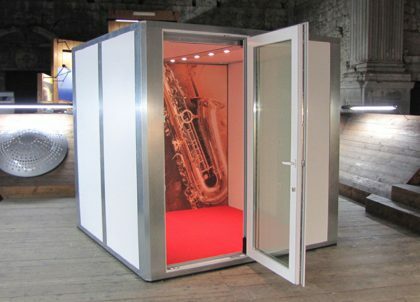 Our Boxy soundproof rooms are easy to use and maintain, look fantastic, and exceed BB93 requirements.